The past few weeks have been mostly taken up with fighting off, hopefully, the last 2 colds of the Winter. 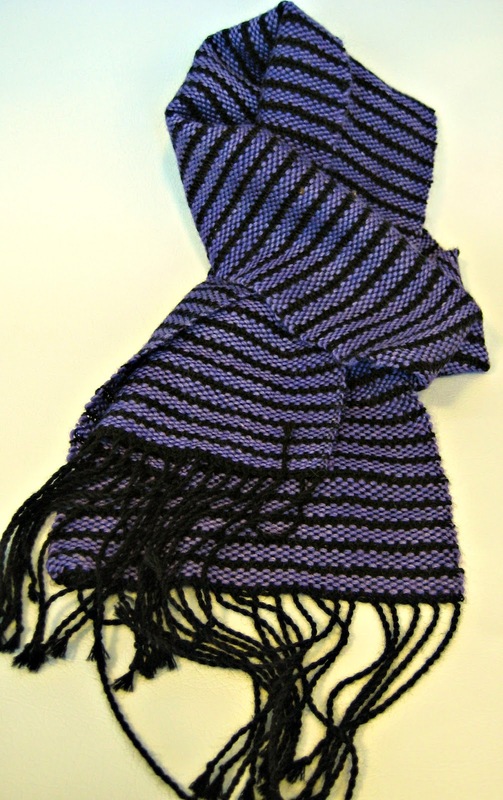 There hasn’t been time or energy for much weaving although I did finish another run of scarves in a basketweave variation. 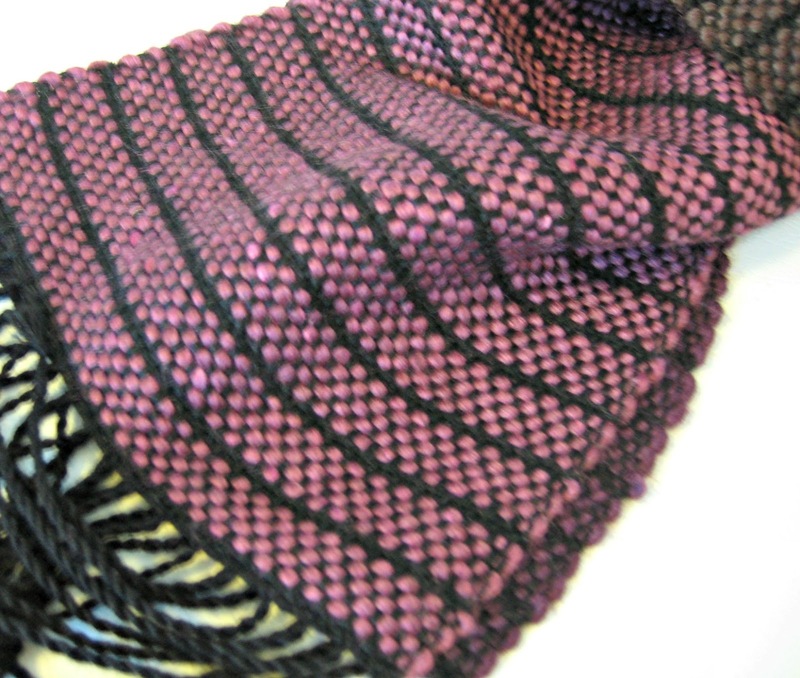 I used a plain black weft and a few different 8 ply knitting yarns, some with random colour changes, some with long repeats. My original idea was to have a widely spaced warp threaded in a straight draw but a few inches in I could see that it wasn’t going to work. 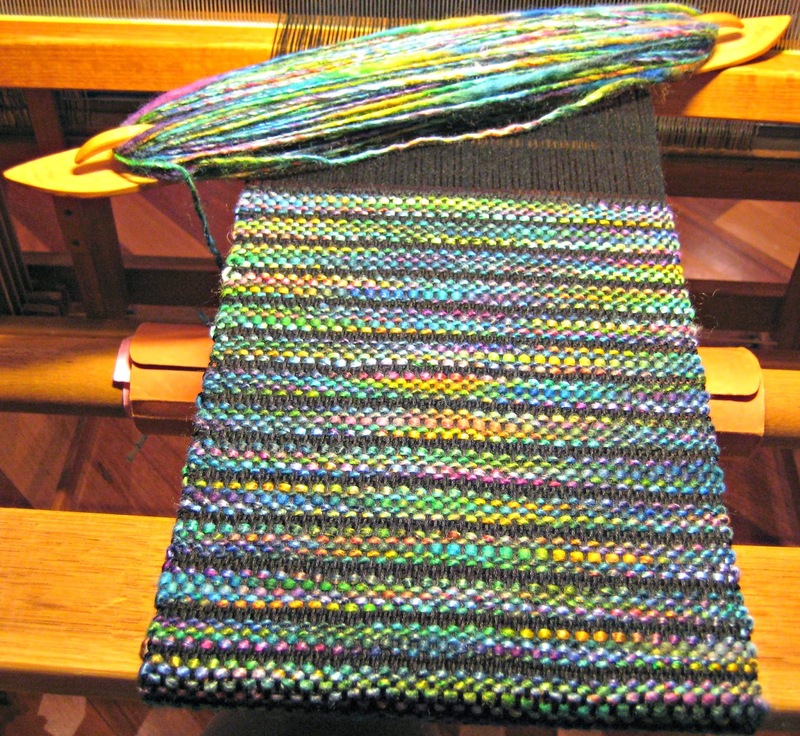 I thought about how I could save the warp already on the loom. I knew I could sley it more closely but then of course it would be too narrow. Taking a deep breath, I wound 2 more sections to make up a reasonable width, unwound the original warp off the back beam leaving it still threaded, added the 2 new sections, one on either side, and wound it all back on to the back beam. I’m sure I’d read about this as a solution but had never tried it. Much to my surprise it went back on to the back beam with no problems and by the time I’d finished the 5 scarves, I’d forgotten the warp’s inauspicious beginning. 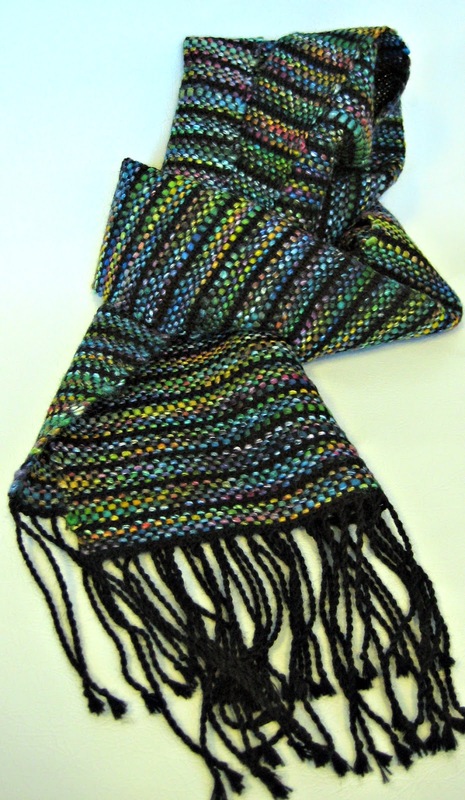 So here they are, 2 were in a wool/acrylic/ viscose mix mostly green but with small amounts of lots of other colours, one of these went straight to my scarf collection. One was a plain violet 70/30 wool/soy fibre mix. The next was the same yarn but I was able to use up the remains of a few skeins in related colours. The last was a pure wool roving type yarn with long colour repeats. 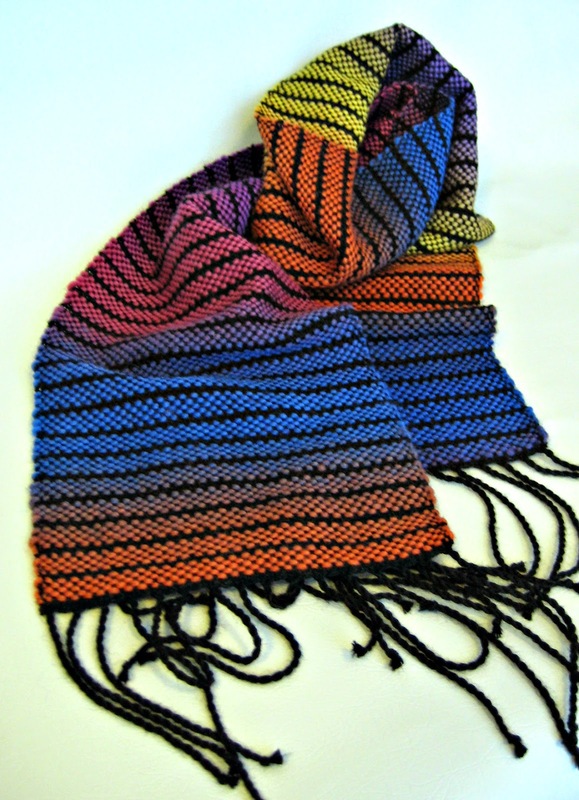 These scarves were easy weaving, probably a good thing as I didn’t need a challenging project. A friend and I spent a weekend with another friend who lives near Geelong and we went to check out the Scarf festival at the National Wool Museum. It’s an annual event but this was the first time I’d been. 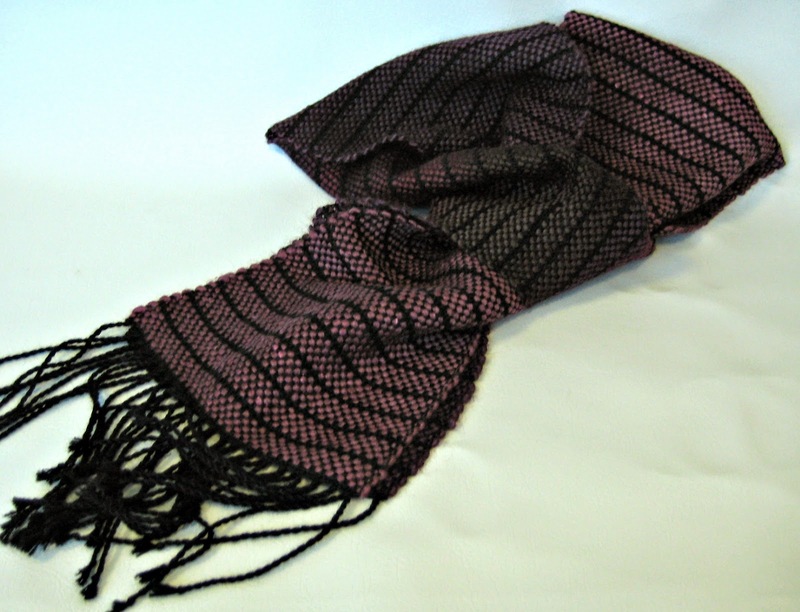 There were a few woven scarves, including a few by weavers I know, but most were knitted or crocheted. I’m not sure what the entry criteria were but I guess I’ll find out as I left my contact details for information about the 2015 Festival. I hadn’t been to the Wool Museum for a long time and they’ve done a great job documenting and displaying the textile history of the area. There was a thriving wool and textile industry in Geelong in the past but unfortunately it’s all gone offshore, mostly to China. No more mill ends for us and more importantly no jobs for the people who used to work in the industry. As well as the scarves there was a great exhibition – Vanished into Stitches - by Ruth Marshall, an Australian artist who lives in New York and knits animal pelts. 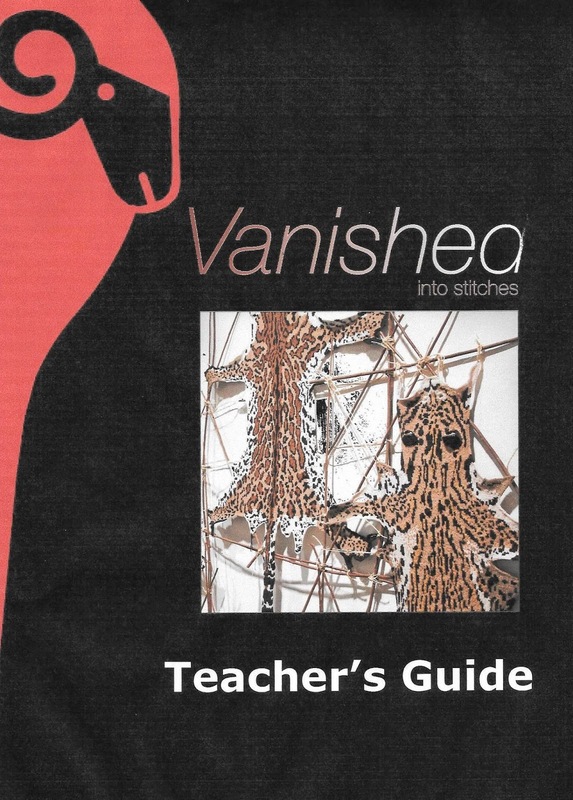 Here's a copy the cover of the 'Teacher's Guide' (school was never like that for me) I borrowed from the gallery website to give an idea of the amazing work Ruth does. It's well worth a look at the link or in person if you're in Geelong or passing through, open until December 7 so there's still plenty of time.